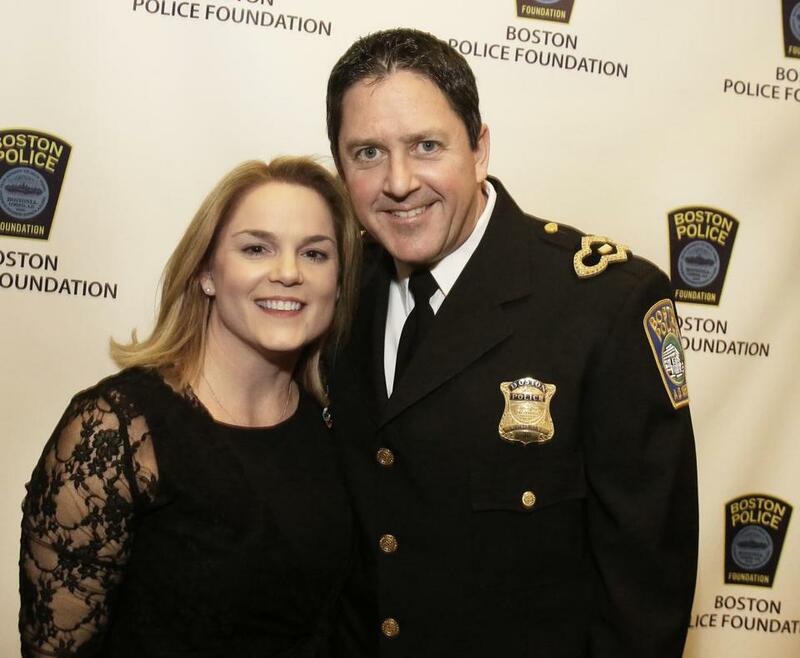 Lieutenant Detective Michael McCarthy and his wife, Kara McCarthy, at the Boston Police Foundation Second Annual Gala in 2015. After a series of controversies rattled the Boston Police Department last month, Lieutenant Detective Michael McCarthy, the public voice and face of the force, has announced that he is moving on to another unit. McCarthy, who headed the department that responds to reporters’ inquiries, stressed that the decision was his and has nothing to do with recent controversial incidents that included a tweet during Black History Month lauding Red Auerbach, the white former Celtics coach, for hiring black players, or a viral video showing Officer Zachary Crossen in a hostile verbal confrontation with an African-American man he had stopped, but who had not committed a crime. He said he has found a fresh opportunity as an investigator in the department’s Boston Regional Intelligence Center, where he can his put his detective skills to work. He started Saturday. McCarthy, who is 47 and served on the force for 24 years, said he made his decision in the past few days. He said he’s proud of what his media relations office has accomplished over the four years since he has been in charge, adding that he is leaving with that department in a good place. Since he took charge, the department has gained more than 500,000 Twitter followers, and despite some controversies, made strides in relations with the city’s residents, notably the black community, some residents say. His department came under fire last month after a media relations officer posted a tweet hailing Auerbach for drafting the first black Celtics, which some called racially insensitive and tone deaf. After the video showing the Crossen confrontation, the ACLU joined other activists in saying the incident highlighted a need for police body cameras and more citizens recording their encounters with police. In a recent editorial, the Dorchester Reporter slammed the department’s media relations for bad publicity incidents, including some of “their own making.” The paper noted that the department last month “liked” a blog known for vulgar and racist rants. The department later unliked the tweet and unliked the blog. But the damage was done. Darnell Williams, president of the local Urban League, said he has worked with McCarthy on various issues in the past and wished him well in his next endeavor.